(CNN) -- A cease-fire between the government of Yemen and the Houthi Shiite rebels was in doubt Saturday after an official said insurgents fired mortars on military locations near the rebel stronghold of Saada, Yemen. 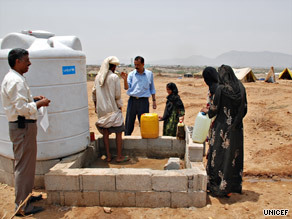 Women and children collect water at camp in northern Yemen for those displaced by fighting. The government remains committed to a cease-fire, but commanders on the front lines reported the rebel fire, said Mohammed Albasha, spokesman for the Yemen Embassy in Washington. Albasha said government forces had not resumed fighting. Aid groups have repeatedly urged both sides to stop fighting long enough to deliver aid to civilians displaced by the violence. Agencies also seek the creation of a humanitarian corridor through which supplies can be delivered. The U.N. Office for the Coordination of Humanitarian Affairs estimates that 150,000 people were forced to leave their homes as fighting raged in the northern Yemen governates of Saada and Amran. The government said Friday it would cease military operations in northwestern regions by noon Saturday if the rebels agreed to certain conditions, according to a statement from the Yemeni Embassy in Washington. Journalists initially reported that fighting in Saada seemed to substantially decrease after the cease-fire began. The editor-in-chief of the Yemen Post, Hakim Almasmari, said rebel spokesman Mohammed Abdul Salam told the newspaper that the rebels had agreed to the government's conditions. Two other efforts to forge a cease-fire have failed. The latest round of fighting began August 12. In mid-August, Yemen laid out cease-fire terms to the Houthi that included removing checkpoints, ending banditry, handing over all military equipment and weapons and offering information on the fate of six kidnapped Europeans who disappeared in June. Houthi leaders twice rejected those terms, government officials said. In releasing the latest conditions, the officials said, "The government calls to insurgents to respond to the voice of reason and commit to peace and an end to the bloodshed. "The government is committed to a comprehensive restoration of the damage caused by this conflict," according to the government statement. • Removing roadblocks, demining conflict zones and descending from higher terrain. • Withdrawing from districts and ending interference in local government affairs. • Returning looted civilian and military property. • Releasing detained civilians and military personnel. • Adhering to the constitution and law and order. Battles between Yemeni forces and rebels in the north have raged intermittently for five years. A government offensive launched last month escalated the bloodshed. The conflict is considered to be both separatist -- over who will assert authority in the area -- and sectarian -- whether Shiite Islam will dominate in majority Sunni Yemen. The rebels are supporters of slain Shiite cleric Hussein al-Houthi. On Friday, Yemen's military opened an investigation into reports that an airstrike intended for Shiite rebels mistakenly killed displaced Yemeni civilians, a Yemen Embassy spokesman in the United States told CNN. Houthi rebels were fighting near the site, the official said. Government and U.N. officials said the civilian death toll was near 90. CNN could not independently verify that number. Albasha said there were no registered camps for internally displaced people in the region where the strike occurred. He said there are claims from humanitarian organizations that Houthi insurgents may have used the civilians as human shields.